Looking for something to add to the mountain of wings and barrel of nachos you have planned for Super Bowl Sunday? 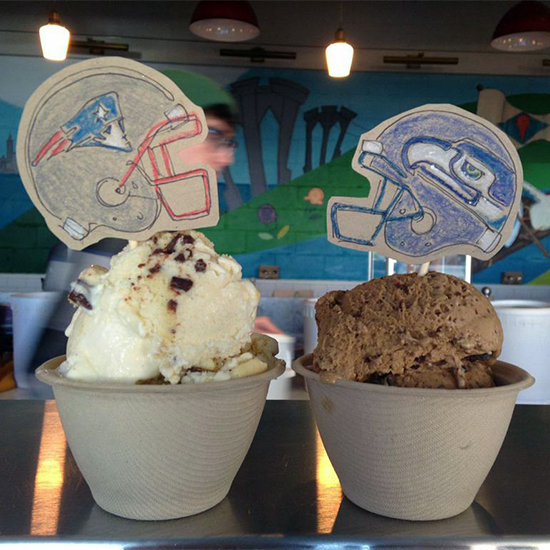 The stellar ice cream makers at Brooklyn’s Ample Hills have created two limited edition flavors specifically for Super Bowl consumption. Fittingly, the two flavors take inspiration from Boston and Seattle. Patriot Pie channels Boston Cream Pie with vanilla pudding, sponge cake and chocolate truffles. In honor of the Seahawks, Caffeine High, as the name suggests, reflects Seattle’s cafe culture with coffee ice cream, regional Dilettante chocolate-covered espresso beans and mocha flakes. The pints can ship nationwide this week and if you need ice cream in time for kickoff, you have to order here by midnight on Tuesday January 27. Plan ahead. It is a scientifically proven fact that fans can not subsist on beer and chicken alone for three quarters.